Despite a minor decrease in the proportion of overdue B2B invoices, 38.7% of Czech respondents reported that their companies have been negatively affected by past due invoices. Consequently, they needed to postpone or even default on payments to their own suppliers. The proportion of uncollectable B2B receivables is stable and write-offs occurred most often due to the customer’s bankruptcy and the inability to locate the customer. The proportion of total B2B sales on credit in the Czech Republic decreased slightly from 43.0% last year to 41.8% in 2018. Similarly to what has been observed in the other countries surveyed in the region, the percentage of sales on credit to domestic B2B customers is higher than that of credit sales to foreign B2B customers (44.7% versus 38.8%). The main reasons respondents sell on credit to their domestic B2B customers are because the customers are trustworthy and they have long-term business relationships. They also said that often, their domestic B2B customers request credit. According to the survey findings, respondents are most likely not to offer credit if they lack information on the customer’s business or payment performance (mentioned by 39.1% of respondents) and because of poor payment behaviour (cited by 30.4% of respondents). We trade on credit because our domestic customers request it. It is the main condition for doing business with us. Well-established business relationships is also the top reason mentioned by Czech respondents in regards to selling on credit to their foreign B2B customers. Credit seems to be offered to foreign customers also because it’s considered standard in the industries they operate. The main reasons for refusing to grant credit to foreign B2B customers are poor payment behaviour (mentioned by 25.9% of respondents), high currency risk and a lack of information on the customer’s business or payment performance (each of these reasons was noted by 22.2% of respondents). We trade on credit to reward long-term partnership and trust. 89.8% of respondents in the Czech Republic reported late payments by their B2B customers in 2018. This is the second highest in the region and far above the regional average of 80.7%. The percentage is stable compared to one year ago and more respondents have mentioned late payments by domestic B2B customers than by their foreign B2B customers (93.8% versus 85.7%). Based on the survey findings, there was a minor decrease in the proportion of overdue B2B invoices in the Czech Republic; from an average of 36.9% in 2017 to 34.1% this year. This occurred mainly because of a drop of almost four percentage points in foreign past due B2B invoices. The average Days Sales Outstanding (DSO) figure in the Czech Republic decreased by two days in 2018 and stands at 44 days. Among the Eastern European countries surveyed, the Czech Republic recorded the second lowest average DSO after that of Slovakia (43 days). 74.7% of respondents said that they expect their company’s DSO to remain stable over the coming 12 months, 10.8% that they expect it to increase slightly and 9.1% expect a slight decrease. Among the Eastern European countries surveyed, respondents in the Czech Republic are setting the shortest average payment terms for their B2B customers. Domestic B2B customers are given, on average, 25 days to settle their invoices. This is one day less than in 2017. Foreign B2B customers are given, on average, 31 days to fulfil their payment obligations – two days less than in 2017. The majority of respondents in the Czech Republic (55.3%) said that they do not differentiate payment terms between domestic and foreign B2B customers. Of the remaining respondents, 29.0% said that they are likely to give their domestic B2B customers less time to pay invoices. A lower 15.8% said that they are likely to give domestic customers more time to settle invoices. Reasons for differentiating payment terms are industry practices, internal policies, payment terms dictated by law and the economic situation in the export country. In 2018, there is not much difference between payment delays by domestic and foreign B2B customers. Czech respondents reported an increase of one day in respect to domestic B2B customers (on average, 16 days) and a four day decrease in regards to foreign B2B customers (on average, 13 days). The changes in average payment terms and in payment delays caused a small decrease in the country’s average payment duration. This went down from 46 days in 2017 to 43 days this year. 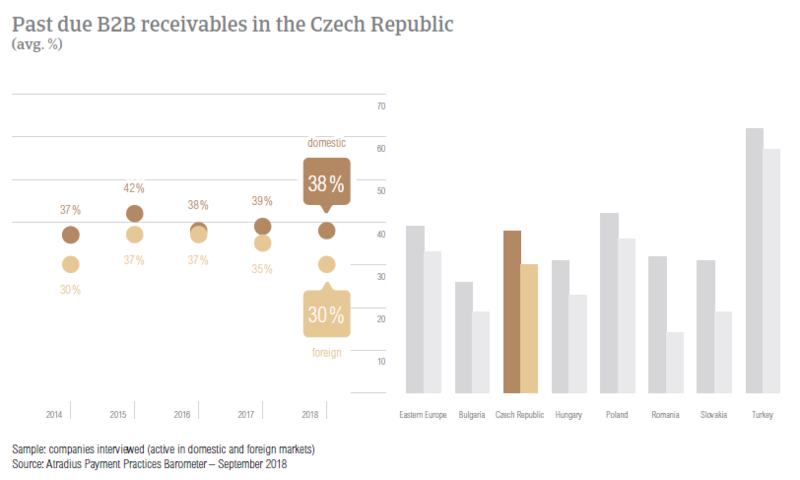 Domestic payment delays in the Czech Republic were reported to occur most often because buyers are using outstanding invoices as a form of financing (mentioned by 51.4% of respondents). The Czech Republic had the highest percentage of respondents to cite this as a primary reason for payment delays - far higher than the regional average (30.9%). Insufficient availability of funds – the main reason for domestic payment delays in Eastern Europe – was cited by 48.2% of respondents in the Czech Republic. 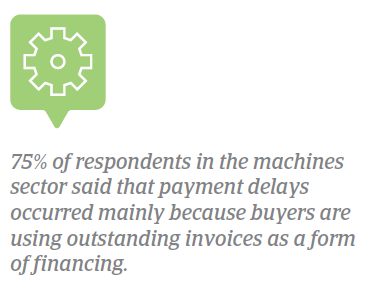 Czech respondents also reported buyers using outstanding invoices as a form of financing as the top reason for payment delays by foreign B2B customers. 51.0% of Czech respondents cited this – the second highest percentage in the region after that of Turkey. The second most frequently mentioned reason for payment delays by B2B customers abroad was the complexity of the payment procedure, cited by 33.3% of respondents. According to our survey findings, the majority of businesses have not been significantly impacted by overdue invoices (61.3% of respondents stated this). Of those who reported an impact, 17.3% said that they needed to postpone payments and 11.9% said that they had to default on payments to their own suppliers. For 11.3% of respondents, overdue B2B invoices led to revenue loss. Most of the respondents in the Czech Republic, 77.9%, said that they are already invoicing their domestic and foreign B2B customers online and 11.1% of respondents plan to adopt e-invoicing in 2018. In contrast, 10.6% of said they are not using e-invoicing and 1.0% indicated that they have stopped using it. Of the respondents already using e-invoicing, 39.0% said that after invoicing their B2B customers electronically, they received payments on their B2B invoices quicker. For 57.1% of respondents online invoices did not have a noteworthy effect on payment. 3.9% noticed a slowdown in speed-of-payment. Of four potential risks to global economic growth (US protectionism turning into a trade war, Fed policy becoming misguided, a ‘hard landing’ in China, geopolitical risk), Czech respondents perceived US protectionism turning into a trade war and geopolitical risk to be the most significant. 34.7% said US protectionism turning into a trade war is the biggest risk while 30.7% stated geopolitical risk is. Both percentages are below the regional level. The average proportion of uncollectable B2B receivables in the Czech Republic is stable at 0.9% (no change compared to last year). Similarly to findings of previous surveys, B2B receivables of domestic B2B customers were written off as uncollectable more frequently than those of foreign B2B customers. Uncollectable receivables originated most often from B2B customers in the construction, consumer durables, business services and services sectors. 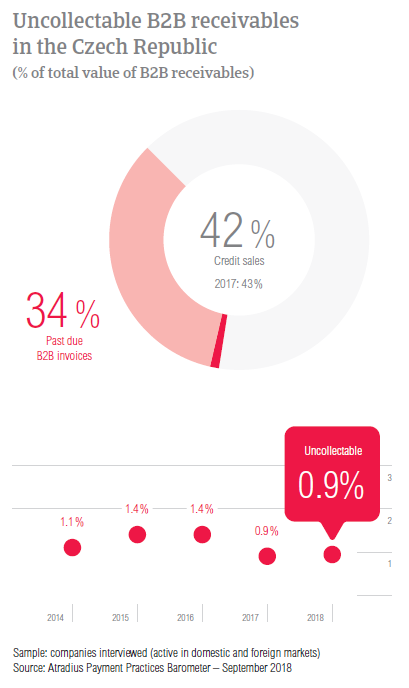 Czech respondents said that the main reasons for writing off B2B receivables as uncollectable are the customer going bankrupt or out of business (reported by 64.4% of respondents), the inability to locate the customer (31.1% of respondents) and the cost to pursue debtors being too high (cited by 30.0% of respondents). 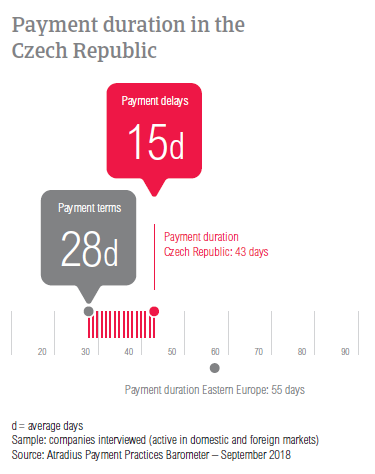 As mentioned above, B2B customers of respondents in the Czech Republic are given the shortest average payment terms in the region (on average, 28 days). B2B customers in the machines and transport sectors enjoy longer payment terms (on average, 37 days). In contrast, B2B customers in the agriculture and consumer durables sectors are asked to settle payments much faster (on average, within 19 and 20 days respectively). Similarly to what was observed in 2017, B2B customers in the construction and machines sectors remain some of the slowest payers. Czech respondents received payments from B2B customers in construction, on average, 15 days late and from B2B customers in the machines sector, on average, 11 days late. As stated for the country overall, the main reason for payment delays was buyers using outstanding invoices as a form of financing; 60.0% of respondents stated this in the construction sector and 75.0% of respondents in the machines sector. Looking at the coming 12 months, most respondents in the Czech Republic do not expect changes in the payment behaviour of their B2B customers in the above-mentioned sectors. Should a change occur, they believe that this will be for the better.